Join the revolution enjoyed by millions of book lovers! Click here and start reading. 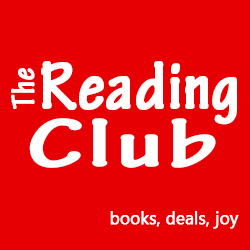 The Reading Club lets you know about free and discounted books that you and your family may enjoy. It's free to join, you can read on any device, and the books are yours to own and share. "Can I just say how much I love how you've made this about so much more than books? I love learning about authors, trends and such." "I read constantly. Finding good, new reads wasn't easy, until I found The Reading Club. Saved me so much time and money!" "I love that it's so much more than just books. I've discovered so many new and wonderful books I otherwise never would have found." "It's the best reading club I've ever joined. Sign up without hesitation. It's fantastic!" "So glad I found this. I joined another deals service and they flooded my inbox. The Reading Club doesn't do that." If it weren't for The Reading Club, I never would have rediscovered my love of reading. "The Daily Deluge is what I used to call that other service before I ditched it for you guys. My inbox thanks you, The Reading Club." "One of the best kept secrets around. Shh... Don't tell anyone, just tell EVERYONE! I love, love, love what you do for books and readers."